An elegant and radiant damask trail has been created using a special embroidery technique known as couching. This is where coils of cords are over-sewn with a fine thread to create a three-dimensional effect. Cornelli presents a classical damask design in electronic format on a woven striped background with tonal variations of beige offering a sleek contemporary finish. 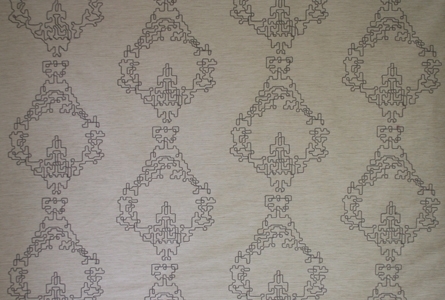 This fabric is also available as a textile panelling as shown in image.